I have a hoard. 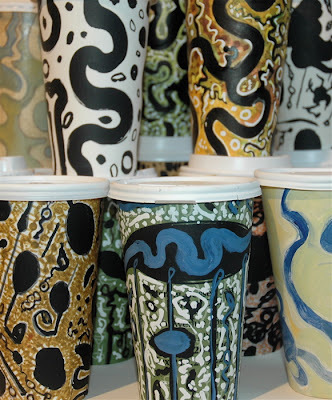 The coffee cups, hundreds of them, with and without drawings, are spilling all over my studio. I also stack them behind a folding screen at home and they topple out. 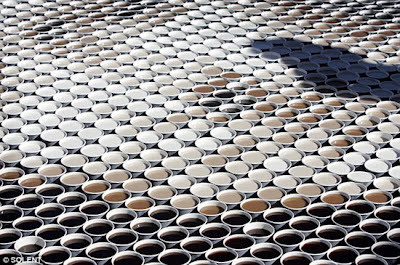 Coffee lids and sleeves find their way everywhere. After almost a year of saving every cup I buy, I can't throw them away. I was carrying one in my hand on 9th Avenue the other day. It was a brownish one from a deli, with an ugly cream-colored pattern of coffee cups and on it. I hate to get that cup. The color does not please me and it is hard to transform into anything interesting. I threw it in a trash can and walked away. A few steps later, I turned. It sat on top of the pile, looking forlorn and abandoned. I went back and retrieved it. According to Randy Frost and Gail Steketee, authors of the book Compulsive Hoarding and the Meaning of Stuff, once I start anthropomorphizing my trash I may be in trouble. On the upside, they suggest that hoarders may “inherit an intense perceptual sensitivity to visual details,” and speculate about “a special form of creativity and an appreciation for the aesthetics of everyday things.” Well that sure does describe me. Perhaps that is why I was so able to correctly identify art from trash in a recent competition on Joanne Mattera's art blog. Trash is finding its way into lots of art these days. My artist friend Barbara Lubliner calls it Upcycling and she has just curated a highly entertaining and colorful exhibition by that name at the Educational Alliance in New York City. I went to the opening with my younger daughter who was overwhelmed with the desire to play with all the sculptures. I will go see Upcycled again on my own before it closes on January 20th and have been enjoying the digital catalogue. 5 vessels made from plastic post consumer waste. post-consumer waste. I look forward to exhibiting my own hoard in March of 2011 in the Garment District. 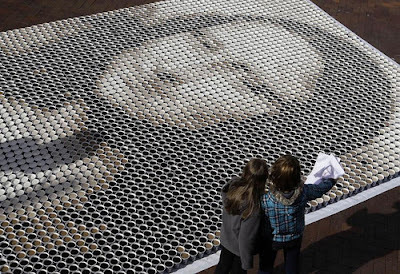 And just to keep me on task, an artist friend sent me this image today of the Mona Lisa, made from over 3,000 cups filled with coffee and varying amounts of milk. Now that's a lot of throw-away Joe! filled with different amounts of milk to create the different tones and shades. 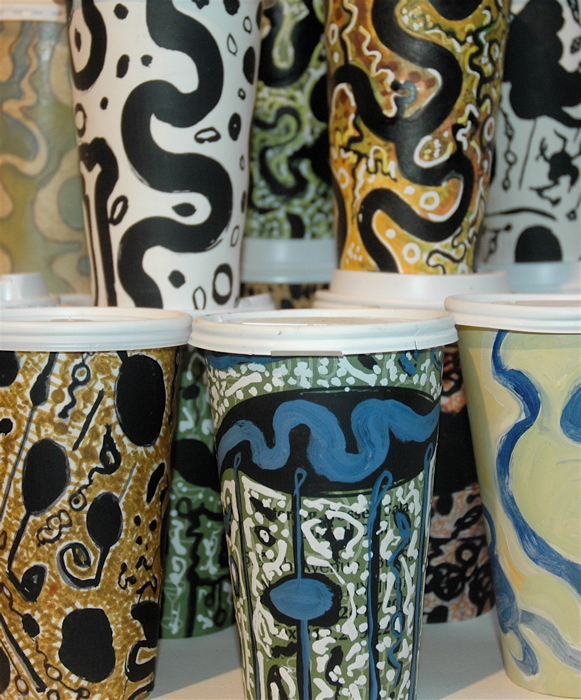 I love your coffee cup paintings! How do you get the paint to stick to the waxy exterior? I don't know why I think of Giorgio Morandi vases and pitchers when I see Shari Mendelson's "Untitled" 5 vessels ( and your embellished paper cups as a table top still life). WOW to the coffee installation of Mona Lisa. Move over Chuck Close! Thanks, Gwyneth, for sharing this wonderful post. I love the image of the coffee cups spilling out of every corner, from behind the screen, from the trash - what a wonderful metaphor for... for what? Our 21st century spiritual journey, the modern consumer society, the artist's psyche? Whatever, keep up the beautiful work!